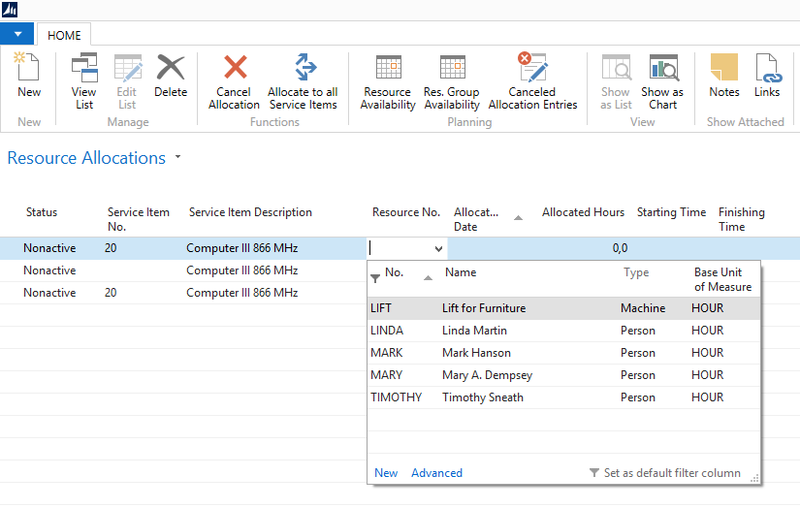 The Microsoft Dynamics NAV Service Module provides a dispatch board, this board, however, being no “board” in the literal sense, but a table containing the orders that contains Service Item Lines that are not allocated. Everybody having worked with this board knows that it will take some clicks to find an appropriate resource for the Service Item Lines with the help of the internal NAV functions. On the whole it is quite a tedious procedure and the planner will lose chronological overview of the not allocated orders as well as of available or occupied resources. Exactly this overview is offered by the Visual Service Scheduler (VSS). With the help of this interactive Gantt chart, all service orders and their Service Item Lines - whether they are allocated or not – will be displayed in ONE view. The resource groups and resources are listed in a table. The allocated orders are visualized along a “time line”, this letting the planner recognize start, end date, duration and response date of the Service Item Line as well as the allocated resource. Not allocated Service Item Lines are displayed in a list view positioned to the right, categorized according to priority. They are allocated to the resources manually by drag and drop. Of course, Service Item Lines having been scheduled already can be moved from one resource to another as well as along the time line. 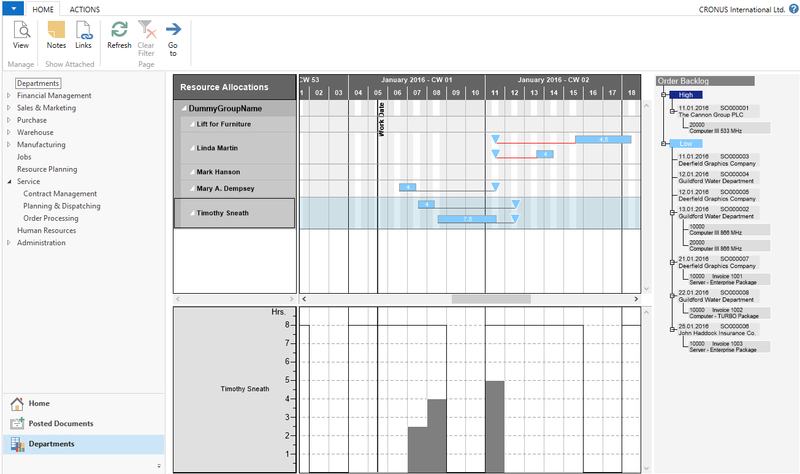 In addition, the capacity curve below the Gantt chart of the Visual Service Scheduler shows the workload of the resource and red flags overload or unused capacity. The term “add-in” might lead you to assuming that an additional tool requires additional data maintenance and with that additional effort for the one operating it. But add-in really means that the VSS is completely integrated in NAV, so that it directly accesses the standard NAV data. Data changes in standard NAV lead to automatically adjusting the visual planning board. If an order is allocated to a resource in the VSS, the NAV data will be modified automatically. The NAV system and the external planning board always share the same status. As stated above, the Service Module contains a lot of details on customers, orders and resources which is vital either for the planning as for a good customer service. For instance the work calendars that are created for each employee are included in the planning. This and other details are visualized in the Visual Service Scheduler so that the Service order and its Item Lines can be allocated to the corresponding optimal resource. But there’s much more the VSS can do to simplify the scheduling of service orders and the allocation of resources. As already shown in the video, a Service Item Line can be split to accelerate the processing of an order or to avoid capacity overloads. The resources being used in the Service Module of NAV are also available to the Jobs Module. To avoid double allocations, the Visual Service Scheduler also shows the resource allocation of the Jobs Module. For further details read the corresponding blogpost. If a certain skill is required for a Service Item Line and NAV has this information stored, the Visual Service Scheduler flags the resources offering that skill. This feature is dealt with in another blogpost. Do you want to know more about the Visual Service Scheduler? We’d like to introduce to you the Gantt add-in with all its functions in an online demo. Request an online-demo.